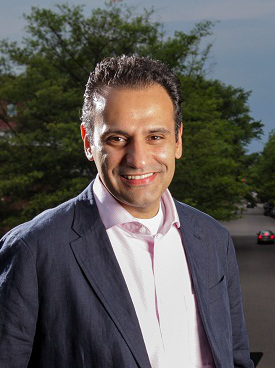 Fouad Fakhouri (M.M.-Composition/Theory '97, M.M.-Orchestral Conducting '01) has served as music director and conductor of the Fayetteville Symphony Orchestra since 2004. To honor his final concert with the orchestra, the Cumberland Community Foundation announced the creation of the "Fouad K. Fakhouri Endowment for Artistic Excellence," paying tribute to his tenure as conductor. "Eleven years ago, Fouad Fakhouri came to this community and transformed our symphony and stole our hearts," said foundation executive director Mary Holmes in announcing the endowment, which totals more than $1.1 million received from anonymous donors. "This fund will continue Fouad's legacy of excellence forever." The announcement was a surprise to Fakhouri, who called the endowment "truly an honor." Fakhouri has been conducting internationally for nearly two decades, starting with a performance at age 22 in the International Jerash Festival of Jordan. In 1999, he conducted the first West-Eastern Divan Orchestra in Weimar, Germany, as one of only three students invited by world-renowned pianist and conductor Daniel Barenboim to participate in his conducting masterclass. Since then, Fakhouri has received increasing recognition on the worldwide stage. As a result, he has been invited to conduct extensively throughout the United States and abroad, with recent engagements that include serving as principal guest conductor of the Greensboro Symphony Orchestra (North Carolina) and music director and conductor of the Greensboro Symphony Youth Orchestra, to which he was named in 2009.
International guest conducting appearances include the Lebanese Philharmonic Orchestra, the Cairo Symphony Orchestra, the Bulgarian Symphony Orchestra, and the Amman Symphony Orchestra (Jordan). In the summer of 2009, Fakhouri was invited to study with Neil Varon at the Eastman School of Music Summer Conducting Institute, where he conducted the Rochester Philharmonic Orchestra. Fakhouri’s past positions include an assistant professorship at Methodist University, and an instructor position in theory at Penn State. He has also held the post of assistant conductor of the University of North Texas New Music Ensemble, Penn’s Woods Music Festival Orchestra (where he partnered with conductor Pu-Qi Jiang), and the Penn State Philharmonic. Lauded for his artistry and ability to elicit the best musical results from orchestras he conducts, Fakhouri is a committed proponent of the subjective interpretive style of conducting. As such, his performances have been celebrated for their broad, dynamic, and powerful interpretations, which model the Austro-Germanic conducting tradition of Furtwangler and Celibidache in going beyond the score to capture both the essence and spirit of the music. In addition to conducting, Fakhouri is also a distinguished and diverse composer of orchestral, chamber, choral, and solo music, whose work has been enjoyed internationally. His orchestral music has been premiered and performed by orchestras including the English Chamber Orchestra, the Bulgarian Symphony Orchestra, the Mediterranean Orchestra, the Philadelphia Youth Orchestra, the Fayetteville Symphony Orchestra, the Cairo Symphony Orchestra, and the Amman Symphony Orchestra. Born in Beirut, Lebanon, Fakhouri was trained on the piano and is the fourth generation in a line of musicians and composers. He received his bachelor’s degree in music theory and composition from West Texas A&M University, and holds a master’s degree in orchestral conducting and master’s degree in composition/theory from Penn State. He received his doctorate in composition from the University of North Texas, and also holds an honorary “Doctor of Humane Letters” degree from Methodist University (North Carolina). Fakhouri currently resides in New York City with his wife, Diane Lavelle-Fakhouri, and their daughter, Isabella Margaux. He is the music director of the Saginaw Bay Symphony Orchestra. Click here for the full article regarding the "Fouad K. Fakhouri Endowment for Artistic Excellence."